If I only had a nickel for every time I’ve been asked, “is there a simple test that can quickly determine an executive’s leadership ability?” The short answer is yes, but keep in mind, simple and fast aren’t always the same thing as effective. There are a plethora of diagnostic tests, profiles, evaluations, and assessments that offer insights into leadership ability, or a lack thereof. My problem with these efforts is they are overly analytical, very theoretical, and subject to bias. That said, they are fast, easy, and relatively inexpensive. The good news is, there is a better way. If you really want to determine someone’s leadership ability, give them some responsibility and see what they do with it. Leaders produce results. It’s not always pretty, especially in the case of inexperienced leaders, but good leaders will find a way to get the job done. Hi Madeline – I completely agree with your sentiments. To build an extraordinary company, you must light the fire in the bellies of your workforce…You must get them to feel passion about your organization and to connect with your vision. You must get your employees to engage. As the CEO, your ability to transfer your passion to your employees is the essence of being a great leader…So much so that if you can’t accomplish this, you simply can’t be a great leader. Think of any great leader, and while you’ll find varying degrees of skill sets, intellect and ability, I challenge to name even one that did not have passion, as well as the ability to instill said passion in team members. 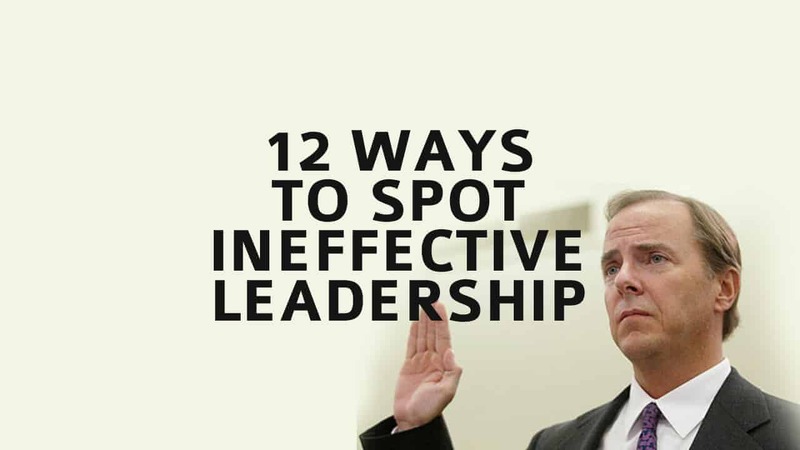 This is a good post and addresses many of the worst characteristics of ineffective leadership. Effectiveness should be the litmus test for leadership. For more check out "Are You Ineffective?" on Amazon. Others include a lack of focus on culture, failure to question assumptions, and poor innovation. This is a great summary of the characteristics leaders must avoid to become and stay effective. I'm concerned about point #2, however. I agree that a substantial track record is a solid indicator of effective leadership, but I see a distinction between a LACK of a track record and a POOR track record. Someone just getting started as a leader is not a proven leader and as a result is more of an unknown quantity — but that does not mean that they are automatically an ineffective leader. Inexperienced, yes — ineffective…that remains to be seen. With good mentoring, that new leader will be effective. I tend to agree with your clarifying comments. That said, while someone may not have prior related experience, everyone does indeed have a track record. Academically, relationally, occupationally or experientially, everyone has a story. Put simply, some stories provide more certainty than others, but sometimes the best rewards come from taking a risk. What's important is to have clear visibility and to recognize what you are or are not dealing with from the outset. Thanks for sharing Lori. Thanks very much for your response…and for this great list. I've bookmarked this page. I love #4. I see it all the time- “leaders” that will still put their wants before those of the organization & the people. This is a result of poor attitude & absolute disengagement. When someone acts this way- they have already checked out emotionally and should leave while they can still do it with some sort of integrity intact. Their selfish way of thinking drags the whole place down. Nothing to add here…well said Gina. My question is how many of these traits are natural and how many do you believe can be instilled? Unable, unwilling or uninterested in learning and growing and therefore not capable of inspiring others to learn and grow. I believe Goethe once said “You can easily judge the character of someone by how they treat those they believe can do nothing for them” and I’ve heard Richard Branson once employed this idea, in a search for prospective employees, by disguising himself. I’m not suggesting accomplishments should be disregarded. I just think they’re secondary in importance in assessing a potential leader. An individual of sound moral character can be trusted to learn most of the other requisite skills to ensure great outcomes. Thanks for sharing. I too prefer non-traditional interview questions. I have watched the interview process at many companies devolve into little more than a beauty contest question and answer session. Interviews were never intended to be about how well someone can give a canned response to a canned question. The first priority of an interview should be about getting to know the character of the candidate. I like your post very much. It’s short and sharp. Thank you! I’m happy you enjoyed the post Thao. Thanks for stopping by. This article should be posted in every company in America, but somehow I suspect that won’t happen. Can I copy it to my blog with a backlink to you, please? Thanks for the kind words and feel free to republish with attribution. Thanks for asking. An ineffective leader will not be in charge very long. Eventually the team or co-workers will start following someone else or the ineffective leader will be fired. A great leader is someone who is willing to listen to other points of view even if he does not agree. The reason is to learn. If a leader thinks he knows everything he will soon be gone, which is best for the company. Thanks for sharing your observations. We are in total agreement. A “leader” who allows themself to be managed by a self seeking team member(s) is a disaster waiting to happen. It leaves the other team members questioning who they really report to. Spot-on. It’s important to encourage and reward the right behaviors, not the wrong ones. Accurate, concise list. And so true. Nice job! Sound advice – thanks for sharing. I would also be looking for demonstrated behavior that is trustworthy, interdependent, genuine, empathetic, appropriate risk taking and innovative as well as success in goals as well as the satisfaction level of people accomplishing the work. Can’t argue with that:) Thanks Dianne. Lack of Performance, Lacking Vision and not being accountable are the worse traits of a mediocre leader. Touched, moved, and inspired by this. Am excited to share a link to this with my teammates! The fact that I winced reading two of them is a great sign that I’ve identified work I need to do! PS- An amazing bi-product of this approach is the amount you yourself will learn from it! I’m a leader in education. I have taken on schools that have ‘lost their way’. In each school there have been fundamental problems with the way the schools have been led/managed. In each school the degree of ineffective leadership from the principal has been proportional to the outcomes for learners. The school I have just joined is one of the lowest performing schools in the country. Go figure. I agree with every single one of the statements listed above as I have picked up their consequences time after time. Of course I can’t say that I am perfect but I do know my weaknesses and their impact on others. Can I suggest a lack of self awareness as number 13? Thats a really interesting perspective looking at the other side of the coin when people focus primarily on good leadership traits. I think people always look for character in leaders. If they have little or no honour/integrity/character then they can’t be trusted and wont want the best for their team. I think there’s a overall theme within this list that you’ve written and thats a lack of confidence in leadership. Any leader studies leadership and finds improvement through personal development of their chosen skill. leadership in the outer world is different in the kingdom leadership because it is the world or government that is freed from the sin! all u must to do is repent first so that we can lead people to the right path of salvation! This list should be mailed to the White House. On every count, Obama has failed. I worked for a so called leader. He had a vision for the heck of it,had a target for others to achive or be fired, had a nice blue print document made by a consultant for the division only to be put in cold storage, he regularly held monthly review meetings to blame the subordinates, for him a discipline was most important meaning not opening our mouths on bad things, there was always his assurance on resources but never fulfilled,if there was any slippage we would loose whatever little we had. He would the repeat the mantra he would tolerate anything other than slippage on discipline and performance. I can go on, on and on. To summarize his leadership style was bulldoze, manipluate,demoralize , divide and rule. He killed the organization and he was eventually fired. Hi Mike. You’ve got some interesting insights here. I do believe the a leader who manifests these characteristics cannot lead long enough because sooner his organization is headed for a disaster. He will not be able to keep the best people to help him for I am sure they will leave the company so soon without hesitation. For me , an authentic leader must be a servant leader- one that seeks the best for his people and not only for himself. He must also be flexible meaning he able to use different leadership styles to adapt to a particular person or situation. The list probably could have been condensed a bit by combining 6 and 11 (focus) as well as 7 and 12 (vision/forward looking) – separated they are a bit redundant.